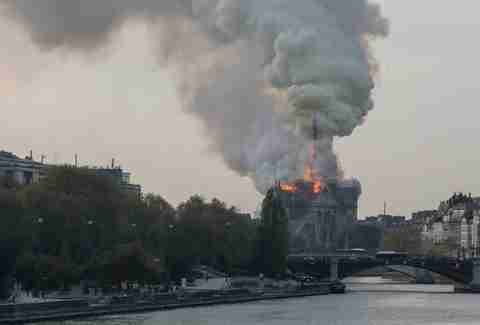 Notre Dame, the landmark medieval Catholic cathedral in Paris, was ravaged by a massive fire on Monday. Damage to the historic building -- completed in 1345 -- and its troves of priceless contents appears to be horrific. Firefighters responded to the blaze late on Monday afternoon local time, according to a report by BBC News, but the flames continued to rip through Notre Dame as night fell on Paris. So far, the cause of the massive fire is still unclear, but reportedly could have something to do with renovation work at the historic cathedral. Officials said at least one firefighter was injured while battling the blaze and the damage to the iconic structure looks to be catastrophic. The overall structure of Notre Dame, however, has been saved from total destruction, according to French officials. As NBC News reports, a French interior ministry official shortly said before midnight that both of the cathedral's towers are safe. While it's too early to know the full extent of the destruction, reports and images that have emerged from the scene are devastating. Much of the centuries-old cathedral's roof had collapsed, along with its iconic spire. The fire also spread to one of the cathedral's main rectangular towers at one point, the Associated Press reported. 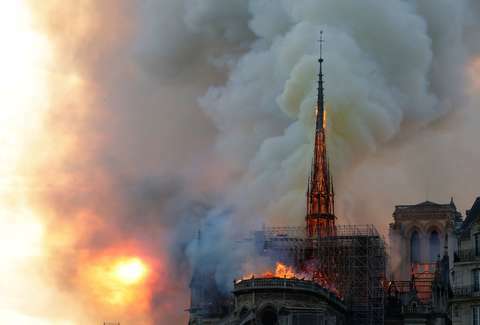 “Everything is burning, nothing will remain from the frame," André Finot, a spokesman for the cathedral told local media, according to The Daily Beast. Early reports indicate the fire appears to have started somewhere in the cathedral's roof. Finot told The New York Times that the spire caught fire and that the building was evacuated sometime after 6:30pm. The spire was under renovation as part of an effort to restore the cathedral. In a statement reported by BBC News, French President Emmanuel Macron said in part, "Like all of my countrymen, I am sad tonight to see this part of us burn." Macron canceled a scheduled speech in response to the fire and traveled to the scene. Paris Mayor Anne Hidalgo described it as a "terrible fire" and urged people int he city to stay away via a post on Twitter. As the fire raged on into the evening, crowds poured into the streets to watch and pay respects as firefighters continued to battle the blaze. Many of the somber gatherings turned into emotional vigils, as Parisians and tourists alike joined in prayer and song to mourn the historic site. France's civil security agency says they are using all means necessary to control the fire, except for water-dumping aircraft, according to Bloomberg. The agency said that dumping water from above like that onto this type of fire could cause the whole structure to collapse. Notre Dame is the most visited monument in Paris, seeing nearly double the number of tourists each year than Eiffel Tower, according to a report by The Washington Post. Work on the cathedral first started in 1163 under King Louis VII and was completed in 1345. Notre Dame was in the middle of extensive renovation work when the fire broke out.